Yep, I like the look of that and the allen key heads.I may have to try that if you don't mind? At first I thought why? really? Then I read this part " The bottom one has non through (1/3 deep) cone shaped holes that align with the screws." and the light turned on and I said brilliant he has created a wedge affect to really grab the entire slot. With this design you are distributing pressure on the bottom of the slot and the top of the slot. This should be rock solid. Extremely good concept and design. It is simple, and it is a large improvement. Festool should be all over this. I will be making one as soon as time allows. I guess you could easily make it longer with an additional hole or two if desired. I will definitely try this myself!! This has been a frustrating aspect of the rail design for me as I have dimpled all my rails trying to tighten them and then still am able to knock them out of alignment. Festool should purchase your idea or you need to market this! If you could somehow add two half attached rivets to the design to keep the halves together but still movable vertically it would make these a serious selling article. What I mean is that the rivet would be welded to the bottom bar, go through the top one and keep them together with a conical top cap while still allowing the top bar to move vertically with the tightening of the screws. Unfortunately Festool don't pay you, this has been already in use. it would be nice surprise if Festool send you Domino or something like that..
Great idea Svar! 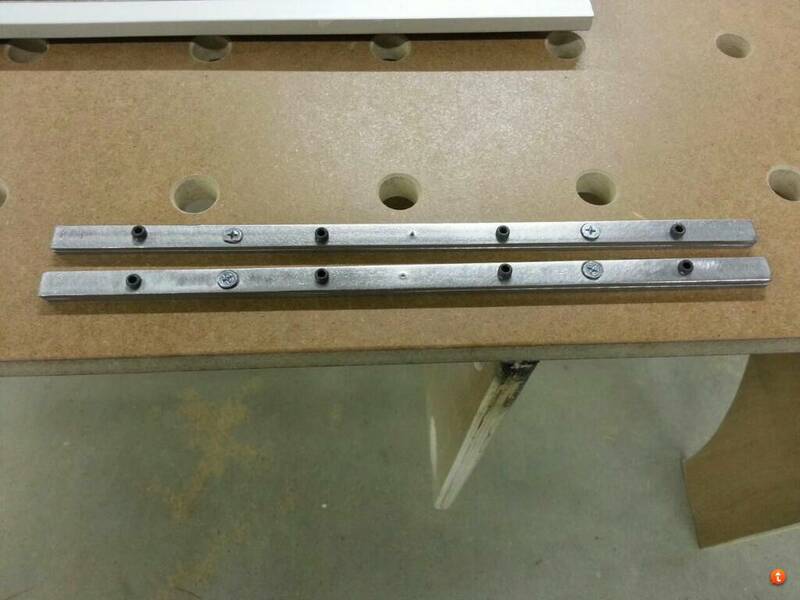 If you wanted to to semi-attach the 2 rails together as Reiska suggested, you could drill a couple holes in one of the bars and epoxy in a couple of thin rare-earth magnets. That would hold them together for ease of assembly but still allow movement. It looks like it works great as it is though. If you store the connectors in the rail there is no need. Oh, no! Makita beat me to that! I won’t get rich! But are Makita’s handmade, and come with file marks left by a skillful craftsman?! Also, when not stored in the rail, set screws could be tightened lightly and they won’t get lost. Pin/screw in the middle will hold parts together. Now I need to build a nice tiny systainer to store the connectors in. Great idea. I'd buy a pair if you made them available. File marks and all! Svar, If you're inclined to make another set, please let me know, I will send you a thank you card and a bank note. This may be a little too far over the top but how about holes in the inside channel so that you could tighten both sets of connecters from the top? I like this idea too, that would make it easier to keep them aligned while tightening. Reviving an old thread. Great great idea! Made a set tonite! I thought about aluminum but felt the set screws would strip out to easy if over tightened. That and my hardware store didn't stock1/8"x1/2" aluminum. I still had to grind that size down a bit. I am going to either paint these or clear coat them. I am not worried about dissimilar materials for a piece that won't be used that much. Dissimilar metals are not issue as long as they are not in the presence of an electrolyte (e.g. water). You won't see any galvanic corrosion as long as you keep the rails dry while joined with the steel connector. As far as I remember Makita Supplying this type of connector with their track saw. I personally found it fiddly keeping to parts together. That's why I attached the two pieces to each other with a small screw. Made my version tonight following you guy's lead. I did try them, connected much more solidly than my old Festool ones. sweet. i'm totally doing this asap. where did you find the stock? Stocks came from Alro Steel here locally in Ann Arbor, Michigan area. We are in automotive world, and it's easier to get stuff in metric locally than the rest of the country I think. Thanks. This type of material is not something I've spent much time shopping for. McMaster-Carr has 2mm x 12 and 4mm x 12 for like $10 for 2 3ft pieces. Just ordered some. Just received the steel from McMaster-Carr and it is a perfect fit. Won't have to do any sizing just a file swipe on the sharp edges. Now to drill for the set screws and I'll be ready. What was the part number from McMaster-Carr? Let us know how it goes drilling the set screws. I'll post a couple pics after I get them drilled and together. One piece of each cut in half will yield a set of connectors. A special thanks to Mr. Bowmannz for the sizes of the steel. It wasn't hard to find the right size at McMaster-Carr. I used only #8 for connecting two piece together, and #10 x 1/4" set screws. Figure if use M6 set screws, more than half width of the material would be drilled out on the 4 mm piece, not sure that will effect the total strength of the connectors. And 1/4" long set screws will stay below the suface of the rail in the slots.